We're over the moon for our newest Bustle Bride, Danielle Fillmore Jaudon! Danielle and her husband Chris said "I do," on a beautiful Alabama March day! The pair met their freshman year at Auburn University. Chris attended Danielle's sorority fall formal with one of their mutual friends. Then, about a month later, out of the blue, Chris asked her out. Danielle didn't remember meeting him at formal, but after doing a little digging on Facebook, she agreed to the date. "Who knew my first date with my future husband would be a blind date at a college dining hall." Danielle said "yes" to a stunning Allure lace fit & flare gown, complete with bateau neckline and illusion back! It was a match made in bridal heaven because she was an absolute dream on the day she and Chris began their forever together! 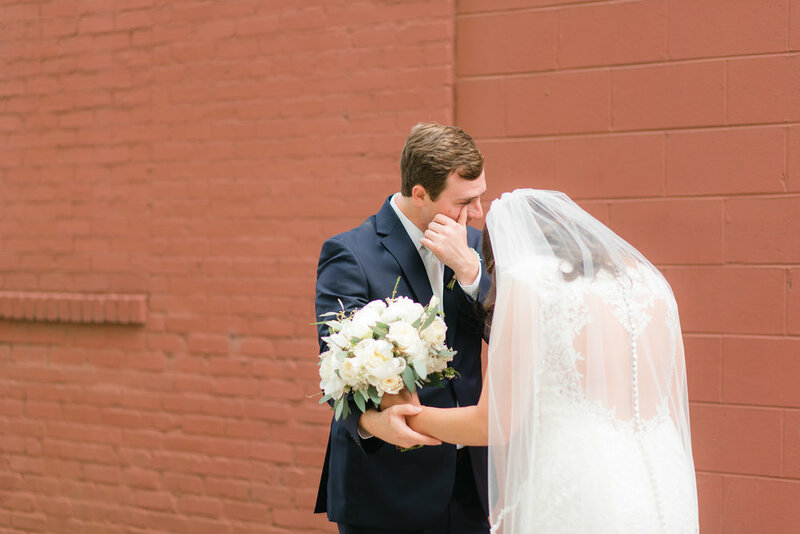 My favorite part of our day was leaving our reception as husband and wife, and seeing how many friends and family stayed the whole night to celebrate us. Everyone was lined up, standing in the rain with sparklers, smiling and cheering for us. It was the only time we will ever have that same group of people we both love and care for in the same place, and we’ve wished everyday since then that we could go back. It was just the BEST day!